According to FireEye, Chinese Espionage Group TEMP.Periscope Targets Cambodia Ahead of July 28, 2018 Elections and Reveals Broad Operations Globally. FireEye has examined a range of TEMP.Periscope activity revealing extensive interest in Cambodia's politics, with active compromises of multiple Cambodian entities related to the country’s electoral system. This includes compromises of Cambodian government entities charged with overseeing the elections, as well as the targeting of opposition figures. This campaign occurs in the run up to the country’s July 29, 2018, general elections. TEMP.Periscope used the same infrastructure for a range of activity against other more traditional targets, including the defense industrial base in the United States and a chemical company based in Europe. Our previous blog post focused on the group’s targeting of engineering and maritime entities in the United States. Overall, this activity indicates that the group maintains an extensive intrusion architecture and wide array of malicious tools, and targets a large victim set, which is in line with typical Chinese-based APT efforts. We expect this activity to provide the Chinese government with widespread visibility into Cambodian elections and government operations. Additionally, this group is clearly able to run several large-scale intrusions concurrently across a wide range of victim types. Our analysis also strengthened our overall attribution of this group. We observed the toolsets we previously attributed to this group, their observed targets are in line with past group efforts and also highly similar to known Chinese APT efforts, and we identified an IP address originating in Hainan, China that was used to remotely access and administer a command and control (C2) server. Active since at least 2013, TEMP.Periscope has primarily focused on maritime-related targets across multiple verticals, including engineering firms, shipping and transportation, manufacturing, defense, government offices, and research universities (targeting is summarized in Figure 1). The group has also targeted professional/consulting services, high-tech industry, healthcare, and media/publishing. TEMP.Periscope overlaps in targeting, as well as tactics, techniques, and procedures (TTPs), with TEMP.Jumper, a group that also overlaps significantly with public reporting by Proofpoint and F-Secure on "NanHaiShu." FireEye analyzed files on three open indexes believed to be controlled by TEMP.Periscope, which yielded insight into the group's objectives, operational tactics, and a significant amount of technical attribution/validation. These files were "open indexed" and thus accessible to anyone on the public internet. This TEMP.Periscope activity on these servers extends from at least April 2017 to the present, with the most current operations focusing on Cambodia's government and elections. Two servers, chemscalere[. ]com and scsnewstoday[. ]com, operate as typical C2 servers and hosting sites, while the third, mlcdailynews[. ]com, functions as an active SCANBOX server. The C2 servers contained both logs and malware. Analysis of command and control logs on the servers revealed compromises of multiple Cambodian entities, primarily those relating to the upcoming July 2018 elections. In addition, a separate spear phishing email analyzed by FireEye indicates concurrent targeting of opposition figures within Cambodia by TEMP.Periscope. TEMP.Periscope sent a spear phish with AIRBREAK malware to Monovithya Kem, Deputy Director-General, Public Affairs, Cambodia National Rescue Party (CNRP), and the daughter of (imprisoned) Cambodian opposition party leader Kem Sokha (Figure 2). 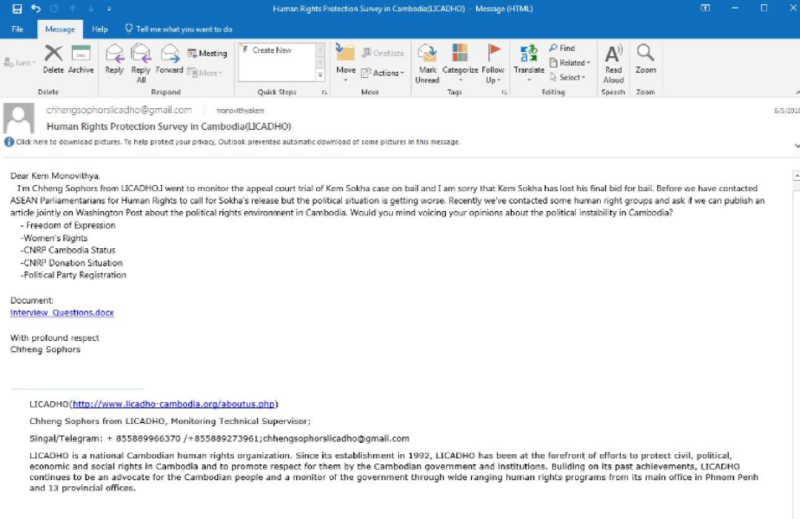 The decoy document purports to come from LICADHO (a non-governmental organization [NGO] in Cambodia established in 1992 to promote human rights). This sample leveraged scsnewstoday[. ]com for C2. The decoy document "Interview Questions.docx" (MD5: ba1e5b539c3ae21c756c48a8b5281b7e) is tied to AIRBREAK downloaders of the same name. The questions reference the opposition Cambodian National Rescue Party, human rights, and the election (Figure 3). The aforementioned malicious infrastructure was also used against private companies in Asia, Europe and North America. These companies are in a wide range of industries, including academics, aviation, chemical, maritime, and technology. A MURKYTOP sample from 2017 and data contained in a file linked to chemscalere[. ]com suggest that a corporation involved in the U.S. defense industrial base (DIB) industry, possibly related to maritime research, was compromised. Many of these compromises are in line with TEMP.Periscope’s previous activity targeting maritime and defense industries. However, we also uncovered the compromise of a European chemical company with a presence in Asia, demonstrating that this group is a threat to business worldwide, particularly those with ties to Asia. Filenames for AIRBREAK downloaders found on the open indexed sites also suggest the ongoing targeting of interests associated with Asian geopolitics. In addition, analysis of AIRBREAK downloader sites revealed a related server that underscores TEMP.Periscope's interest in Cambodian politics. The AIRBREAK downloaders in Table 1 redirect intended victims to the indicated sites to display a legitimate decoy document while downloading an AIRBREAK payload from one of the identified C2s. Of note, the hosting site for the legitimate documents was not compromised. An additional C2 domain, partyforumseasia[. ]com, was identified as the callback for an AIRBREAK downloader referencing the Cambodian National Rescue Party. The active SCANBOX server, mlcdailynews[. ]com, is hosting articles related to the current Cambodian campaign and broader operations. Articles found on the server indicate targeting of those with interests in U.S.-East Asia geopolitics, Russia and NATO affairs. Victims are likely either brought to the SCANBOX server via strategic website compromise or malicious links in targeted emails with the article presented as decoy material. The articles come from open-source reporting readily available online. 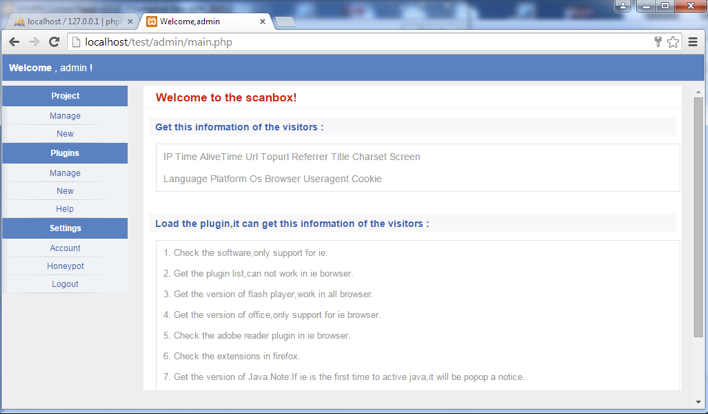 Figure 5 is a SCANBOX welcome page and Table 2 is a list of the articles found on the server. Analysis of the malware inventory contained on the three servers found a classic suite of TEMP.Periscope payloads, including the signature AIRBREAK, MURKYTOP, and HOMEFRY. In addition, FireEye’s analysis identified new tools, EVILTECH and DADBOD (Table 3). Our analysis of the servers and surrounding data in this latest campaign bolsters our previous assessment that TEMP.Periscope is likely Chinese in origin. Data from a control panel access log indicates that operators are based in China and are operating on computers with Chinese language settings. A log on the server revealed IP addresses that had been used to log in to the software used to communicate with malware on victim machines. One of the IP addresses, 112.66.188.28, is located in Hainan, China. Other addresses belong to virtual private servers, but artifacts indicate that the computers used to log in all cases are configured with Chinese language settings. The activity uncovered here offers new insight into TEMP.Periscope’s activity. We were previously aware of this actor’s interest in maritime affairs, but this compromise gives additional indications that it will target the political system of strategically important countries. Notably, Cambodia has served as a reliable supporter of China’s South China Sea position in international forums such as ASEAN and is an important partner. While Cambodia is rated as Authoritarian by the Economist’s Democracy Index, the recent surprise upset of the ruling party in Malaysia may motivate China to closely monitor Cambodia’s July 29 elections. The targeting of the election commission is particularly significant, given the critical role it plays in facilitating voting. There is not yet enough information to determine why the organization was compromised – simply gathering intelligence or as part of a more complex operation. Regardless, this incident is the most recent example of aggressive nation-state intelligence collection on election processes worldwide. We expect TEMP.Periscope to continue targeting a wide range of government and military agencies, international organizations, and private industry. However focused this group may be on maritime issues, several incidents underscore their broad reach, which has included European firms doing business in Southeast Asia and the internal affairs of littoral nations. FireEye expects TEMP.Periscope will remain a virulent threat for those operating in the area for the foreseeable future. This entry was posted on Tue Jul 10 20:00 EDT 2018 and filed under Malware, Ben Read, Marcin Siedlarz, Scott Henderson, Dan Perez, Ben Wilson, China, and Steve Miller. Le groupe d’espionnage chinois TEMP.Periscope cible le Cambodge avant les élections de juillet 2018, et révèle un large éventail d’activités au niveau mondial.